Registration forms are available at the IM-K Community Schools office, or you can contact us by email at imkcs@imschools.org. 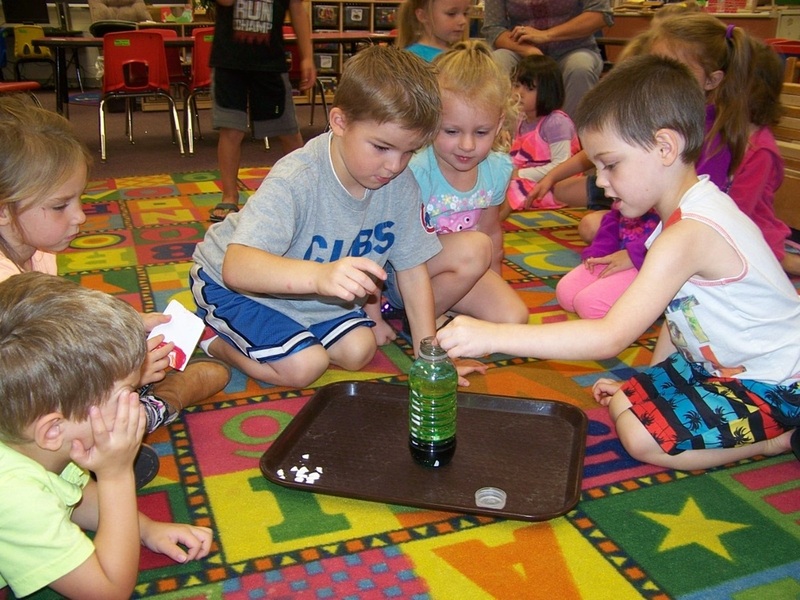 The Iron Mountain-Kingsford Community Schools Pre-School Program provides a learning environment that is designed to stimulate children into learning and working well with others. Our program is designed to offer both flexibility and structure, teacher-directed and child-directed activities. The program is developmentally appropriate and is based on how young children learn. It is designed to academically prepare the children for Developmental Kindergarten or Kindergarten with the attention of the needs and differences of the individual child. Pre-School is designed to prepare your child for Kindergarten with an emphasis on academic skills such as writing, letter recognition, pre-reading and pre-math skills. Our program is "A Land of Discovery". We are ever-changing and ever-growing. Each youngster is encouraged to do as much as they are developmentally ready for. Each child is a special person with special needs, wants, and likes. Together we discover many new and exciting things. IM-K Community Schools Pre-School Program uses The Creative Curriculum for Pre-School that follows the Developmentally Appropriate Practices established by the National Association for the Education of Young Children (NAEYC). The objectives of The Creative Curriculum assist us in planning and assessing children's learning and in supporting the whole child. Our focus is to create a quality environment that will facilitate learning experiences to support positive outcomes for children by having a balance of teacher-directed and child-initiated activities. The teachers will guide the children through the learning process by intentionally exposing them to experiences that support their development in the following areas: literacy, language, math, science, social studies, art, fine motor skills, and large motor skills. We understand that children learn best when they have strong relationships of trust with those who care for them, we focus on creating environments where children feel emotionally and physically secure. We believe in looking at the individual strengths, needs and interests of each child along with their culture, family, and community. Through positive interactions with their teachers, children develop a trusting, caring relationship allowing them to feel safe while exploring their surroundings, and to become capable, and confident learners. We provide a consistent daily schedule that creates a routine which helps young children predict the sequence of events and a feeling of security. We offer multiple interest areas; block/truck, house, art, writing, library/quiet, science/discovery, sensory table, and toys/games. Our classroom design helps children to make their own choices, encourages them to use materials well, and teaches them to take increasing responsibility for maintaining the classroom. We provide opportunities for active thinking and experimenting. Children can explore how things work and have hands-on experiences into the world we live in. The IM-K Community Schools Pre-School is held at North Elementary School in Iron Mountain and at Woodland Elementary School in Kingsford from 8:15 a.m. to 11:15 a.m., Monday through Friday. To enroll in the IM-K Community Schools Pre-School at Woodland Elementary, your child must be 4 years old by September 1, 2018. To enroll in the IM-K Community Schools Pre-School at North Elementary, your child must be 3 years old by September 1, 2018. IM-K Community Schools is a participant of Great Start to Quality of Michigan. As a Great Start to Quality program, IM-K Community Schools Pre-School program meets Michigan's standards for health and safety. We strive to continually improve, meet, and exceed the Great Start to Quality rating standards to offer quality early learning to prepare your child for Kindergarten and success in their future. Click on the buttons below for the Calendars. Pre-School students are welcome to use the North Elementary Child Care Center or the Woodland Child Care Center before and after the Pre-School class. For more information regarding the North Elementary Child Care Center, please contact IM-K Community Schools at 906.779.2660 or ﻿﻿imkcs@imschools.org﻿﻿. For more information regarding the Woodland Child Care Center, please contact Sharon Quick-Dulan at 906.779.7715 or squick@kingsford.org.